Located 500 metres from the Airport Bus Stop at Plaza Espanya, Deco-Sants Fira Apartments offers stylish modern apartments with free high-speed WiFi and a laptop safe. The penthouse apartment has a private terrace. All apartments are air conditioned and come with 2 or 3 bedrooms. Each has a living room with a flat-screen satellite TV. The private bathroom comes with a hairdryer. Large, well-equipped kitchens include a dishwasher and washing machine. Towels and bed linen are provided. Car and bicycle rental is offered and an airport shuttle service is available for an extra charge. Fira de Barcelona Convention Centre is within a 10-minute walk from the apartments. Apartments are located on a building with a small lift, up to 1 person. Please note, when booking more than 2 apartments, different policies and additional charges may apply. This stylish modern apartment offers free high-speed WiFi and a laptop safe. It is air conditioned and has 3 bedrooms. The living room comes with a flat-screen satellite TV. There is a private bathroom with a hairdryer, and the large, well-equipped kitchen includes a dishwasher and washing machine. Towels and bed linen are provided. 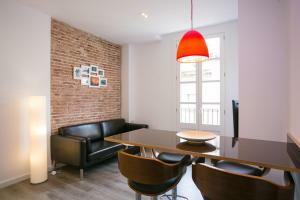 This stylish modern apartment features a private furnished terrace and offers free high-speed WiFi and a laptop safe. It is air conditioned and has 2 bedrooms. The living room comes with a flat-screen satellite TV and sofa bed. There is a private bathroom with a hairdryer, and the large, well-equipped kitchen includes a dishwasher and washing machine. Towels and bed linen are provided. This stylish modern apartment offers free high-speed WiFi and a laptop safe. It is air conditioned and has 2 bedrooms. The living room comes with a flat-screen satellite TV. There is a private bathroom with a hairdryer, and the large, well-equipped kitchen includes a dishwasher and washing machine. Towels and bed linen are provided. Rate: € 76.00 ... € 159.00; select dates below to get current rates.